The American Southwest is dotted with motels that didn’t make it. Travel patterns changed, towns not on the Interstate highway system got smaller, air travel became more affordable, people were in too much of a hurry to even consider an overnight stay in a place like Encino, New Mexico. And, so, here, the Photography Gods blessed me with an illustration of how all those things impacted the Encino Motel, which could not be saved by new management and/or low rates. 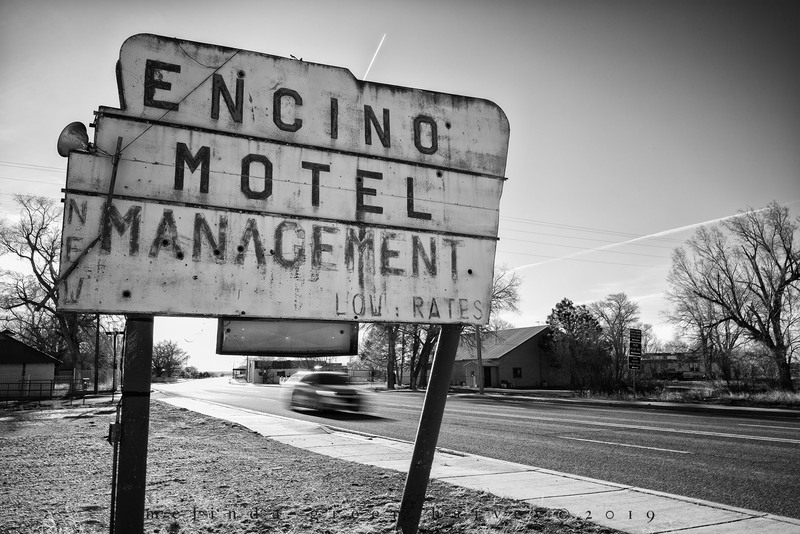 Posted on April 3, 2019, in Photography and tagged 365 photo project, abandoned buildings, black and white photography, changing times, Encino, Encino Motel, Encino New Mexico, learning to see, Leica, melinda green harvey, monochrome, one day one image, out of business, photo a day, photography, postaday, road trip, take time to look, thoughtful seeing, travel photography. Bookmark the permalink. 6 Comments. To me, one of the saddest things about the Southwest is hundreds (thousands?) of failed businesses scattered throughout the countryside, all preserved, presumably forever, by the dry desert air. You have said in earlier posts that every picture tells a story. This one apparently tells several. A big fan of damp, I am not neither. Nohow. Except for brief stays in south Texas and in New Orleans (both for college, oddly) I’ve lived my whole live in arid or semi-arid climates. It’s marked me forever. I agree. Even here in Knoxville TN. it took decades for “Downtown “ to even begin to recover from I-40/75 . Back in the early 1980s, when I was getting that (mostly useless) degree in urban planning, the impacts of Interstates on downtowns would have been a good thesis topic. Too bad I didn’t think of it!